LG has slapped a price-tag on its recently-unveiled LG G Pad 8.3 tablet, but is yet to inform UK buyers exactly when they'll be able to get their hands on the device. Those hoping to pick up the device will have to fork out £259.99, with the Korean manufacturer only committing to a pre-Christmas roll-out in UK and Ireland. The device, announced at the IFA tech show in Berlin last month, is the first full HD device with a screen 8-inches or larger (1920 x 1080p) and packs a 1.6GHz Snapdragon 600 quad-core processor. There's a large 4600mAh battery, yet the device still weighs in 338g. Rather than battle the 7-inch Nexus 7 and Amazon Kindle Fire tablets, LG's offering will have devices like the Samsung Galaxy Note 8.0 and the Apple iPad mini (and impending sequel) in its sights. 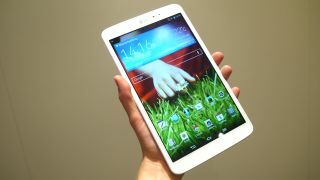 Will the cheaper price point be enough for LG to battle the big two on its return to the UK tablet arena? Let us know your thoughts in the comments section below. Speaking of iPad minis, this time next week we'll probably have a new one to drool over.